Dot and Dash like to do lots of things. They like to bake biscuity treats for their friends, paint colourful pictures and play on the swings! 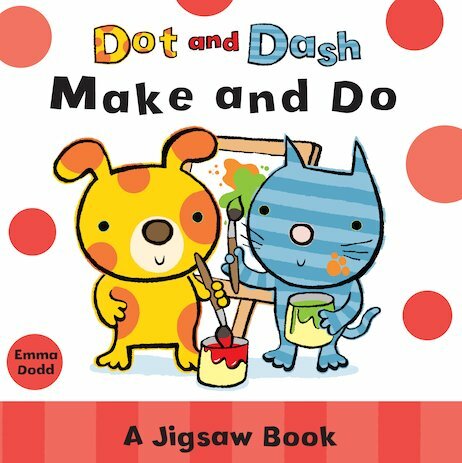 With a sturdy jigsaw scene to complete on every spread, this delightful board book will keep eager little hands busy for hours. Here’s a picture of Dot and Dash having fun with their toys for you to colour in! Colour this picture of Dot and Dash having fun with their ball. Colour this picture of Dash tucking into a yummy dinner! Lovely book from the dot and dash collection will be more fun when my son gets a bit older. Emma Dodd won the Booktrust Early Years Award for I Love My Mummy.